We all know about fair weather friends. We’ve had them, been them. We all have the the friend who is only a friend when times are good, fun, easy, carefree. Then life happens, the going gets tough and the fair weather friends throw up their deuces and are nowhere to be seen. That’s not what I am. I’m a bad weather friend. The friend you call when life gives you lemons. 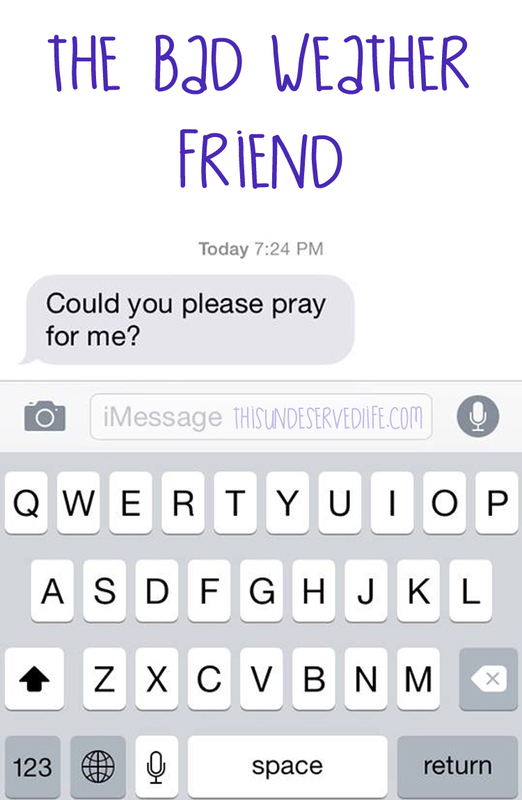 The friend you message when you’re broken-hearted, hurting, in need of some kind. I’m not the only friend like this, I don’t begin to be so prideful as to assume that, and I’m not always as available as I’d like to be during the storm. But us, the bad weather friends, we’re the ones in the background, the ones deep in the message inbox because your life has been going well and you haven’t needed us. I used to resent it, being a safe place. “Don’t tell Betty Sue,” you’d plead to me, “She has no idea I’m going through this.” A week later I’d see you on social media out to dinner with Betty Sue, at the movies with Betty Sue, with nary an invite for me, the person you trusted in your state of vulnerability. “Please help me,” your message would start, “I don’t know what to do.” The next week I’d see the read receipt on my lengthy and well-thought-out response, the words I prayed over and poured into, and see that you’d read them days before without thanks. “I desperately need your prayers,” you cry, “my life is in shambles and I’m terrified of what is to come.” I hold you, cry with you, pray with you, and plead on your behalf at the feet of God, to hear through the grapevine later that everything worked out fine. This hurt me. I felt used, discarded, like a friend of convenience. I was who you turned to in times of need but not times of leisure, someone you knew would be a friend to you but not someone you were interested in being a friend with. I got bitter. I got discouraged. I got jealous. Then I had to wonder – why would God honor my jealousy? Isn’t there totally something in the Bible about not being jealous? Whatever my experiences and emotions, jealousy is never holy or righteous on my part. Whatever Betty Sue has with you that I don’t, it’s not okay to be jealous of. Because you know what? Betty Sue obviously doesn’t have something that I do. Betty Sue may be fun and may get all the girls nights out, but she doesn’t get you at your worst, she isn’t who you turn to when you need someone you know will be there. Also, Betty Sue is a lot more available to go to the movies than I am – I don’t have childcare or spare cash lying around, so I’m glad you have Betty Sue. I couldn’t maintain the friendship that you and Betty Sue have even if I wanted to, so I’m happy to be your person, happy to keep your secrets and know sides of you that few others do. As for the unreturned messages, well, I’m glad you got them. Those words were for you and I hope they helped. I didn’t offer my help in exchange for thanks, and I’m sure that in the moment you read them you were experiencing the chaos you first messaged me about. Your life was obviously upside down in one way or another, so I couldn’t have expected you to behave as normal. You messaged me in desperation and probably read my replies in the same manner… or you just really hated what I had to say, haha! And when I prayed for you I didn’t do so to gain an invitation into your life. Yes, I would really like to hear the good news, or any news, to follow up and know how you are, because I’m genuinely concerned. But I also understand that I’ve just seen you at your worst – I know your deep, dark shames, I’ve seen you heave and snot and wail. I know about your husband’s infidelities and your boss’ activities, your addictions, your failings, your criminal record. I know things that you wish others didn’t, so it has to be hard to feel comfortable around me sometimes, when things are good and you don’t want to look in the eye of someone who knew you when they weren’t. On any given morning, I wake to about 10 messages in my inbox, not including invitations to check out whatever direct sales company my friend has joined. It varies from car seat and cloth diaper advice to marital problems, mental health issues, secret cancer scares, legal problems, and more. I receive texts from many others. On any given day, I will most likely not be able to meet these friends for lunch, go out to eat, see a movie, or come hold them in their living rooms. But what I can do, what I can offer them, is being their bad weather friend. I don’t always know what to say and I don’t always have an answer, but they do always have a friend. They always have someone they know they can reach out to, and how humbled I am that they know it’s me. I could feel petty and jealous that they didn’t invite me to dinner, or I can feel honored that they did invite me into their struggles. I can marvel that sometimes after years have gone by without a word, someone will think of me when they need something, when they need encouragement or advice, and know that I’m the person they want. Because my friendship isn’t for sale – you don’t have to buy it with nights out or mani/pedi days or even “likes” on a Facebook post. I’ll keep doing my life and you’ll keep doing yours, and I’ll be happy to help each time you need me to. Besides, it’s just not possible to be best friends with every single person we know. So we thank you, friends, we bad weather ones who are waiting in the wings. We thank you for trusting us, for turning to us. We thank you for your confidence you share with us and the confidence you place in us. Most likely you come to us because you know we will be there, because something in us wants to be there. We want to help, you’re not a bother. We’d like an update when you can manage and we’d like to share in some of your good times as well, but if we don’t get it we’re still happy for you. Sometimes, just sometimes, we may ask of you what you’ve needed of us – please don’t run. Sometimes we need a safe place, too. Sometimes we need a shoulder to cry on. Sometimes protecting everyone’s secrets gets heavy and we just need someone to sit with. Sometimes we really, really want to go out to dinner, too. So I ask, friends, on behalf of all the bad weather friends, don’t forget about us until you need us. Let us be all-weather friends. We may not be Betty Sue, but we’re here for you, we care about you, and we’re cheering you on from wherever you’ll let us. Hi! I found your article on this site, and was intrigued by your story of being a ‘bad-weather friend.’ I can only imagine the disappointment you feel when those so-called “friends” don’t call you when things are going well in their life. I am sure it makes you feel like you’re on the backburner. May I share a strange situation I am in? I don’t even know if there is a term for it. It’s not quite “fair-weathered friend” and neither it is “bad-weathered friend.” I have a long time friend, let’s name her H. For years, H and I have chatted and texted and email very regularly. In the recent months, I noticed that H is getting less and less responsive to my correspondence, and it has always been me who initiates the correspondence. Lately, it feels like a very one-sided friendship. So I decided to take a step back and see if there is a pattern. There IS a pattern: H seems to be very very attentive and caring ONLY when things are not going well in my life. But when my life is going well, H disappears. Now, I’d like to be clear about one thing – I haven’t changed my frequency of correspondence with her, and this has no correlation to whether my life is going well or not. My habits remain the same. It seems like H actually *prefers* to see me unhappy/miserable so she can join me for company. But when I am in a healthy place in my life, it’s almost as if she feels she can’t relate to me anymore and quietly disappears. Which makes me wonder… does she not want to be around when I am happy? Am I imagining things, or are there such people like that? There are absolutely people like that, I’m so sorry.